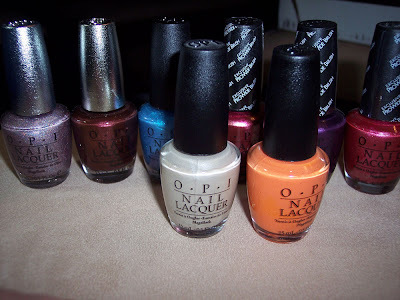 Home » china glaze » color club » essie » hello kitty » holographic » konad » mac » opi » Bday haul part 2! 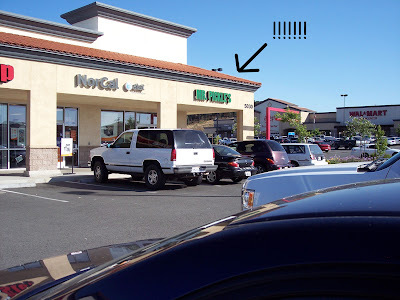 This is where our day started yesterday, we went by GameStop before dinner and we saw a sandwich shop called Mr. Pickles.... lol. I was a 10 year old right here. China Glaze left clockwise: Ruby Pumps, He's Going in Circles, Don't be Square, Visit me in Prism, LOL, BFF, TTYL, DV8 and Lubu Heels. As soon as I opened everything, I immediately painted Olivia's nails (He's going in circles) followed by Mums nails (Don't be square) lol. OPI left clockwise: DS Diamond, DS Jewel, Greece just blue me away, Nice Color, Eh?, You Ottaware Purple, Paint your Toron-toes Rose, Ti-tan your Toga, Osaka-to-me Orange. Color Club and Essie left to right: Revvvolution (been dying to get this, thank you mum) Where's the Soiree?, Front Row Diva, Great Expectations, Eternal Optimist, Tomboy No More and One of a Kind. 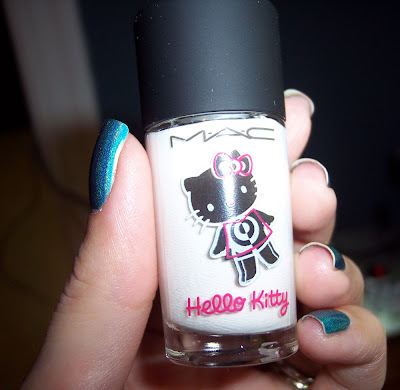 I didn't get any MAC Hello Kitty polishes so this was so awesome! Konad Plates 20, 25, 56 and 62. These are my first real plates (I have 2 and 3 I think from starter kit) I am so excited to try this! I'm bouncing off the walls basically. 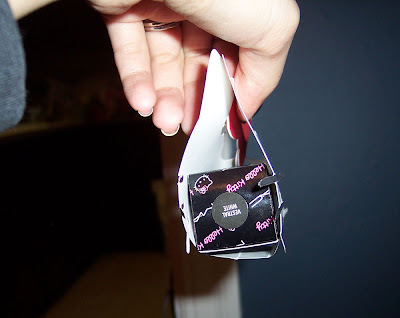 Dumb question: am I supposed to take off the paper thingie on the back of the plates? I didn't try to peel it wasn't sure if it's supposed to be on there or not I am a total Konad newbie. I will be sipping on an icy cold soda with floating HK ice cubes very soon. 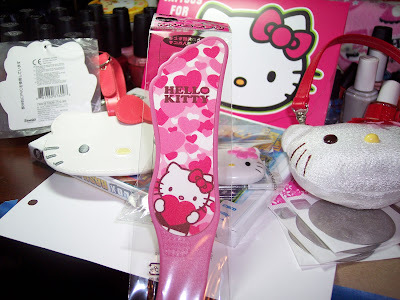 Foot file Olivia and Eric got me, in the background is almost the rest of the HK stuff, coin purse, luggage tag, magnet, pen, card with HK tattoos inside, a Sally's Beauty $50 gift card, and last but not least, Boom Blox!! I was up until 7 am I think it is soooo fun it was everything I expected from it. As soon as I got home last night, I cut my nails and painted them with DV8, I have no idea how I have gone without any holographic polishes but all is well now. The Ott-Lite doesn't really show it well but you guys have seen better swatches and know it's awesomeness right? One last thing, after cutting my nails my C-curve flattened out a lot and my nails hurt really bad for hours, today they are still sore when I type does this ever happen to any of you? Mum and Duad thank you for all these lovely gifts I think I've died and gone to heaven! I need to practice my stamping for a 4th of July mani! Wow, you are so lucky! I'm practically drooling!! :) I'm glad you had such a lovely birthday!! Anyway,i don't think if there's any reason to have the paper at the back of the image plate, but since it ady stick well there so just leave it..
i only heard that those fake Konad image plate might hurt you because the round edges of the plate is 'sharper' than real Konad ones..
where did you get the konad plates from? and how much? It looks like you had an AMAZING birthday. Wow - and all those n/p gifts. Can't wait to see swatches of everything!!! Thanx for sharing! 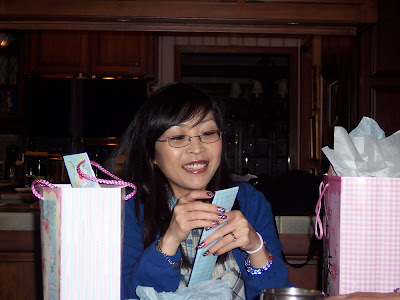 You received such great gifts! How nice :) Your nails look wonderful! Rachel: Thank you, yeah I haven't touched the paper part, and wow how awful would that be if you cut yourself on a plate! Avroys: I can't wait to try all of them! Alexlyndra: Thanks again, I'm so excited to try everything I've already been filing my nails lol. Olivia: Thanks, you already have such nice nails, and even if you wreck a mani outside that's just a great excuse to change colors! Mary: I'm so lucky to have a wonderful family, thank you! 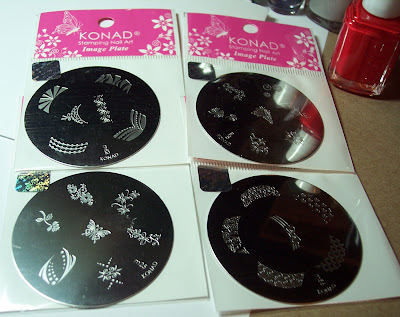 Leave the paper on the back of the konad plates. WHAT AWESOME GIFTS!! My goodness you got a TON of nail polish! 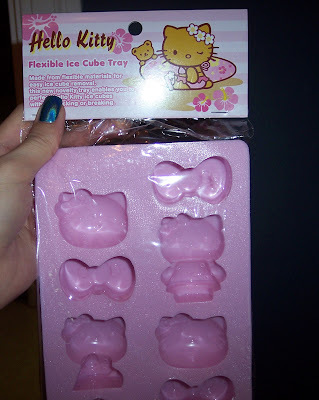 I am so LOVING the HK ice cube tray!!! I would kill for one of those! Brooke, okay thank you I shall leave them be - the starter plates have no paper on them so I was confuzzled. I couldn't believe my eyes as I opened package after package, and I already made some ice my only regret is that they melt fast so you only have about 10 mins to enjoy a glass lol. Wow, it looks like a good time was had by the b-day girl. Nice gifts. I love how the DV8 looks on you and I like the short nails too. I have DV8 and He's going in circles. I love the halos and I can't wait for your 4th of July design. I know it's gunna be good! Hi Denny, yes I had such a fun day! 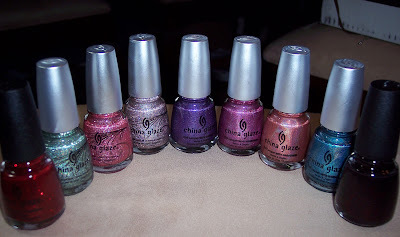 I am so in love with the holos I got I can't wait to try them all! It feels so weird to feel my fingertips touching stuff again lol. I'm so glad that you enjoyed your birthday. You have a wonderful family. They knew just what you loved! 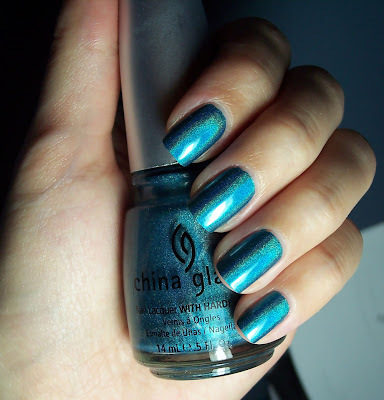 Such beautiful polishes. Can't wait to see them all. I never heard of anyone nails hurting. Strange. Your nails look beautiful. 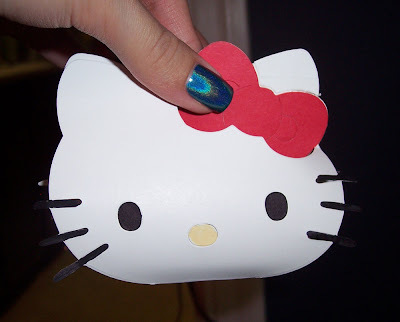 Love all the cute Hello Kitty things. Thank you Lucy, I do have a great family :) I am loving the short nails! Yeah, I guess I need more polish, I seem to have like 10 different kinds of dark pink or red polish... o_O I love that super dark red sparkle one you have though, that's boss! Hi Joyce, thank you! I love the foot file lol. We can never have too much HK!